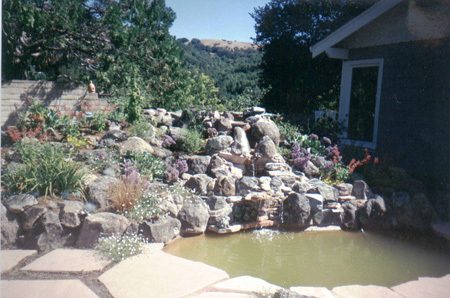 Ovelle Irrigation , Landscape Construction contractor has been serving the Marin, San Francisco and North Bay area for over 25 years, building resource efficient gardens for Beauty and Enjoyment. Services Include: Layout and design services focusing on efficiency of resources. Installation for new garden construction, maintenance services available for the project we install. 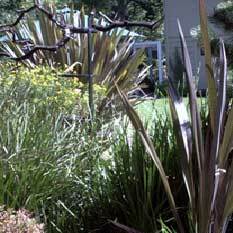 Planned Stewardship before breaking ground allows small corners and micro climates to be reclaimed. 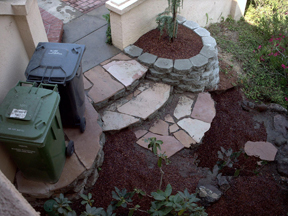 Paver retaining wall for retention and placement, flagstone steps and path back filled with decomposed granite for access, were installed for this composting corner. 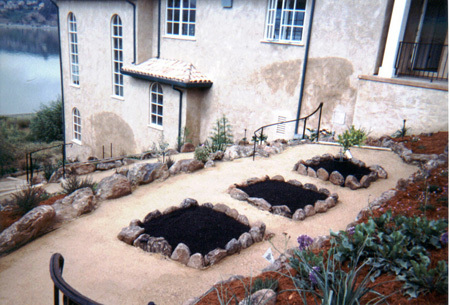 Ovelle has been installing and maintaining artistically designed and sustainable gardens for a diverse client since 1991.Arbors, brick trim for gravel paths, planting, lawn and low volt lights were added to this project to complete a painter's retreat. "Mary, you are the best, I love my new garden!" "Mary, you are a contractor's best kept secret...when I can't fix it or do it..I call you !" 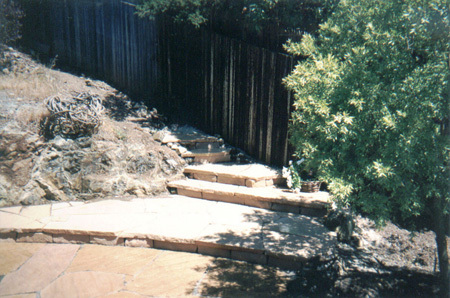 Flagstone Patio and Path Stairs Cut into the rocky serpentine hills of Tiburon, Ca. Building from the ground up. Boulders retaining planting area, path defining, rails, lighting.